When you’re missing a tooth — or multiple teeth — it can negatively affect your appearance, your self-esteem and your general health. But Hammond Dental Centre can help. If you are missing a tooth — or multiple teeth — the team at Hammond Dental Centre is proud to offer dental implants in Bedford as a solution!. When you’re missing a tooth, the surrounding teeth will shift position in an attempt to fill the gap, and your jawbone can break down. This may change your appearance and cause you to look older. You may find yourself restricted from eating certain foods, because of pain or discomfort. You may even be self-conscious about having your photo taken, or speaking up in a social situation. A dental implant is a small titanium screw that functions like a tooth root. The implant is integrated into your jawbone for a long-lasting, secure restoration. 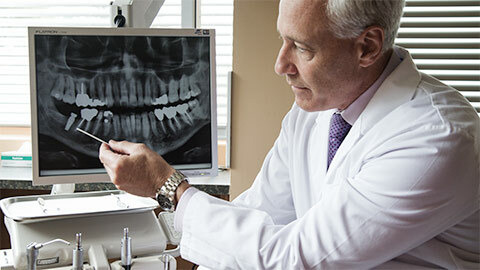 A crown is then attached to the implant, giving you the look of a natural tooth. 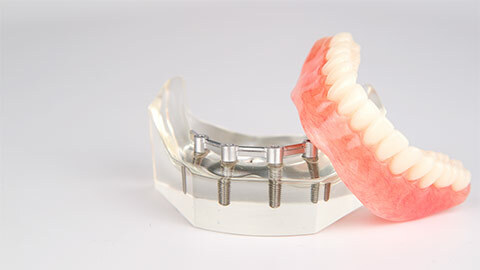 Dental implants can also be used to secure a denture, preventing it from shifting in your mouth. Contact Hammond Dental Centre today to learn more about the ease and comfort of our Bedford dental implants.